Live the life you always wanted when you buy a condo at Boca Towers in stylish, sophisticated Boca Raton. These two dramatic 17-story building jut up in the air and provide residents dramatic vistas of the Atlantic Ocean, a natural preserve park, the Intracoastal, the dock abutting the property, and the city of Boca Raton. Built in 1972 of solid and reliable CBS construction, these buildings have 136 dwellings each. Your new Boca Raton home is on A1A between Palmetto Park Road and Spanish River Boulevard. There are 1- and 2-bedroom units available and all have open and airy floor plans and spacious balconies. Amenities include the heated pool, fitness room, billiards, tennis courts, barbecue grills, shuffleboard, a game room, and a bike-jog path. Want to go to the beach? Well then pack up your beach chair, towel, sunscreen and a good book and walk across the street. There’s a private deeded beach access there for owners of Boca Towers. If you want to stay put and hang out by the pool, manicured trees provide shade by its side and over the common dock area. Bring along your yacht when you move in! And when you want to go out on the town, Boca Raton has it all: nightclubs, super multi-plex movie theaters, world-class dining and exclusive shops. Boca also boasts top-drawer public and exclusive private schools. The Florida lifestyle that you desire and deserve will be yours when you buy this prestigious real estate in sunny, beautiful Boca Raton. Enjoy the culture that Palm Beach County has to offer with a short drive to West Palm Beach. Discover history at the famous Flagler Museum or great art at the Norton Museum. Visit the Kravis Center in downtown West Palm Beach and enjoy Broadway shows, world famous entertainers, or opera and ballet from renowned touring companies. 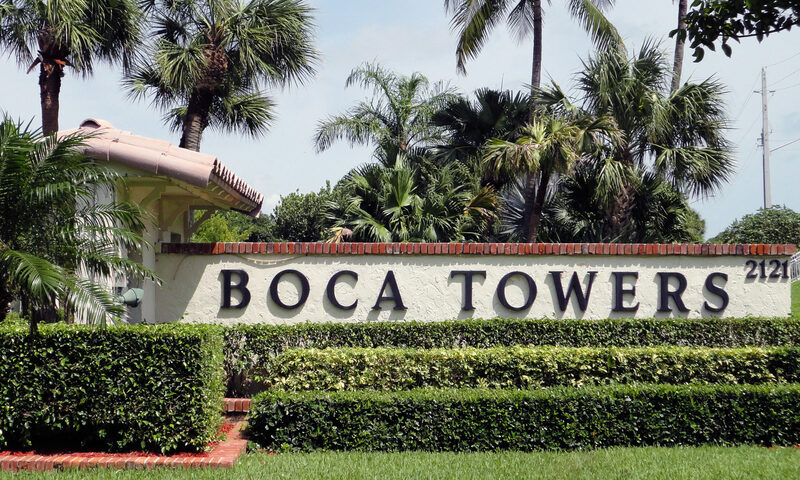 I am interested in learning more about Boca Towers homes.